So to recap, the British are in trouble, Wellesley has ordered the retreat. Donkin's Bde is intact, but the Light Cavalry Bde under Anson is on it's last legs with 3 DISR each. Mackenzie's brigade has been mauled; the Connaught Rangers have broken and the 1/KGL line are trapped in a forward position are being engaged by the French. Wellesley pulls the first card, he nominates Anson. Anson orders his 2 cavalry regiments to the south and then to the east, he tries to rally his men, but he is unsuccessful. Donkin starts his retreat. Laplane's brigade advances west and the 1/25e charge the the 5th. It is not going to be an easy retreat. Darricau splits his brigade in two, with him assuming command for the battalion heading through the olive grove, while the CinC Lapisse stays within command of the other 3 battalions, they all continue west to cut off the British retreat. Lapisse's card is drawn and he orders the 50e under Laplane to charge the KGL. 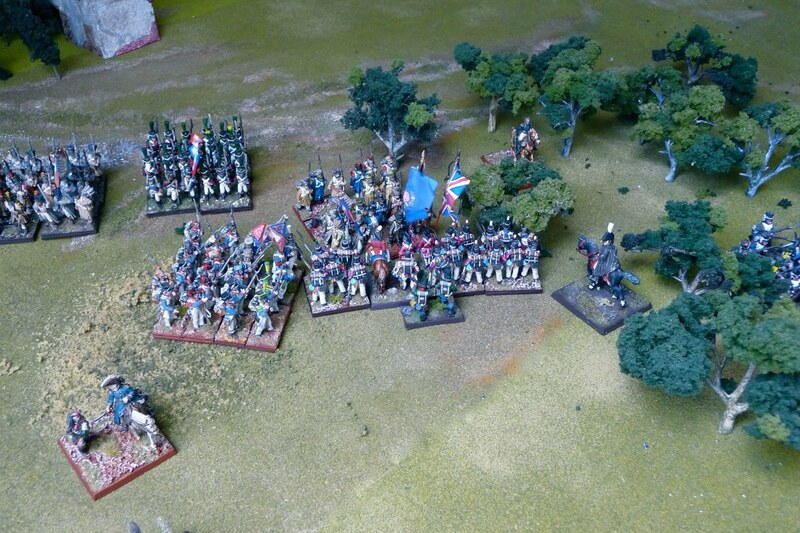 Mackenzie draws his card, he has to defend against 2 French battalions, one taking him in his left flank. The KGL break and Mackenzie's brigade is destroyed. Anson continues his retreat, he just cannot rally his troops. Darricau continues his advance west. Donkin defends against the 1/25e successfully and they break. Wellesley nominates Donkin to move again, the British are giving it a good go. The 5th wheel backwards the 94th and the 24th move towards the bridge. The French are aggressively moving west. The 2/25e attempt to charge the 94th in the flank but just can not get there. Lapisse nominates Laplane, he is able to get the 2/25e to take the 94th in the flank. 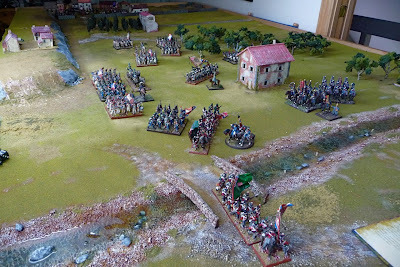 Anson knows that the only chance for the British to safely retreat is if he can rally his light cavalry, they have 3 DISR each and can not charge any of the French Infantry, his third rally attempt is futile they continue their retreat. The next card is Laplanes, he is the cleverest of the French generals, he fires into the flank of the 94th, they take casualties. 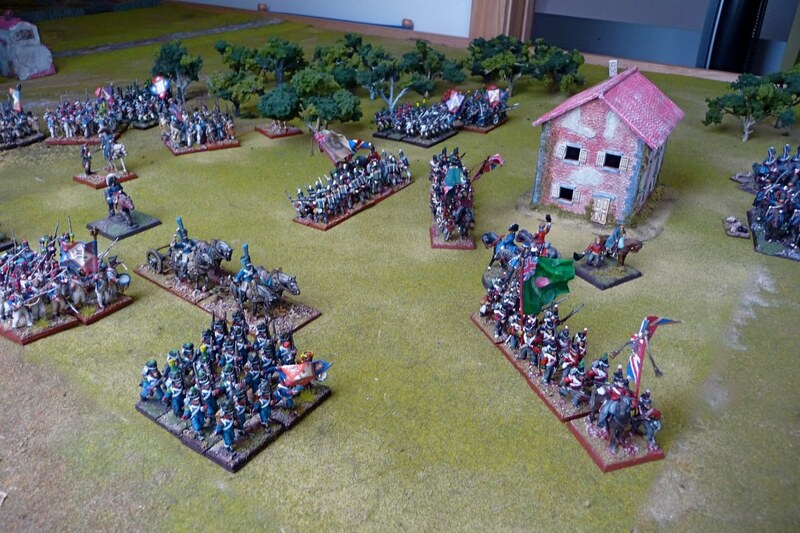 The 82nd also cahrge the 94th, the Scots are in trouble. 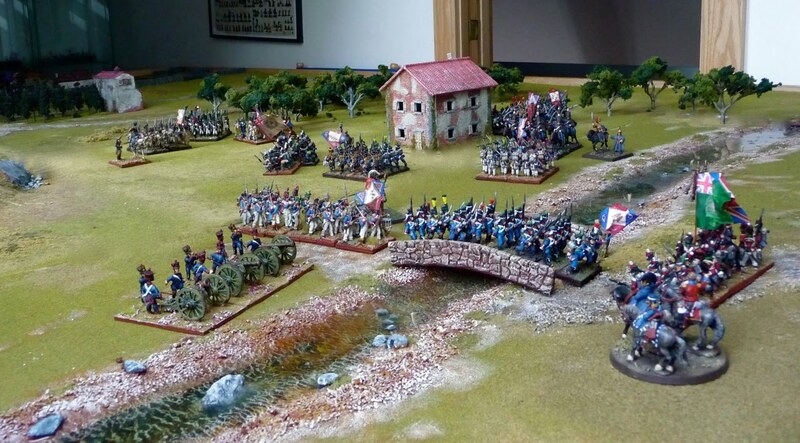 The Welsh are also in trouble as they are charged by the 50e ligne. Finally Donkin's card is drawn: the 5th fire and cause casulaties in the 50e. The 94th fail to fallback, they engage in combat with both the 82e and the 2/25e, the Scots luck runs out and they break. The Welsh have a bit more luck, they drive back the 50e. The 24th has made it over the bridge and form into a second line of defense. 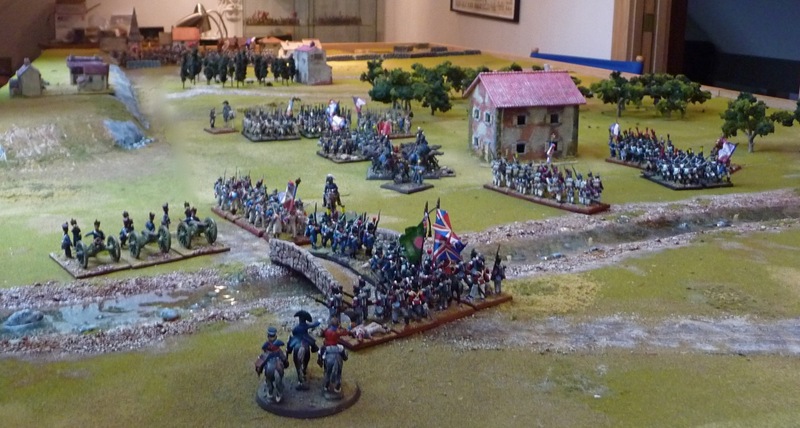 The British have reached their break point, but still have the morale to carry on. 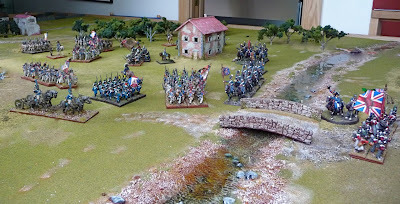 Darricau's brigade continues it's advance. Donkin's card is drawn; the 5th continue to harry the 50e with musket fire. They continue their move by flank to cover the retreating units. Morale stays high. Laplane's card is drawn, his infantry battalions have got the Light Dragoons in a crossfire, they break. 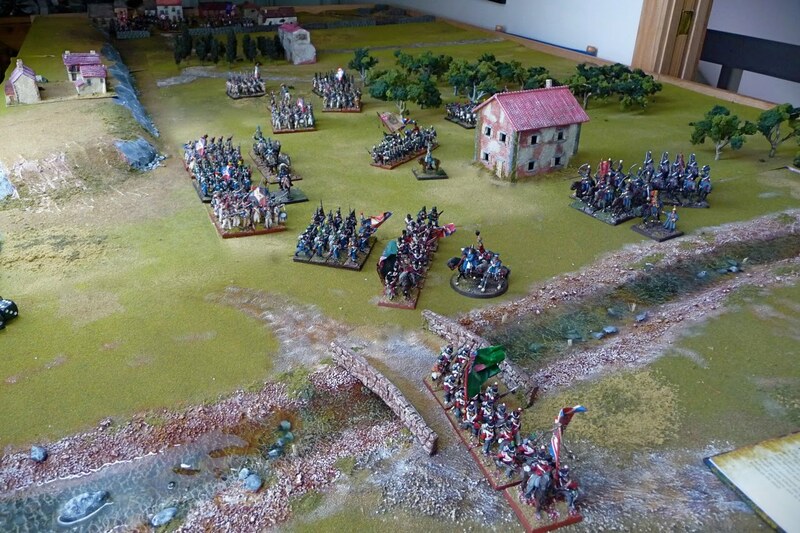 Darricau moves his Light Horse Artillery to the river's edge and they unlimber. Anson attempts to rally the KGL Hussars are futile, their horses are exhausted trying to elude the French infantry. Wellesley orders Donkin to continue the assault on the 50e, they break; the 5th continue their slow flank maneuver. Miraculously, their morale holds. The French assault has now reached the bridge Lapisse orders the 2/25e to take it. I was impressed at how well the Lasalle rules held up to tinkering and even though 6-7 full (4 phases) mini-turns were played in each turn the game moved along quite quickly (If I was not recording every move, these 5 turns would have played out in a little more than an hour). The card activation system kept things in doubt and it really made playing solo a lot of fun. I have to think about the number of cards I used as I am not 100% sure, if using CinC cards is the best approach although it did add to the suspense. For those who are interested, I have charted the last 5 turns of the game so you can actually see how the muti-phased play went for each turn. An impressive set of rules to be sure!! 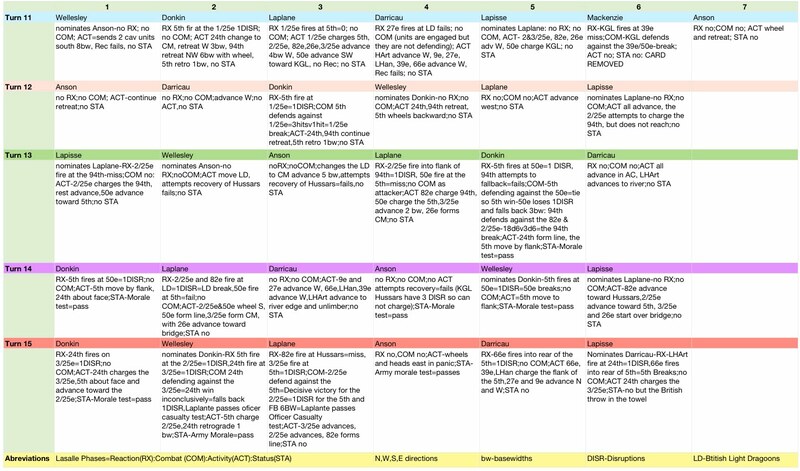 Double-click on the chart, it is quite readable. The game runs from left to right and than down for each turn. 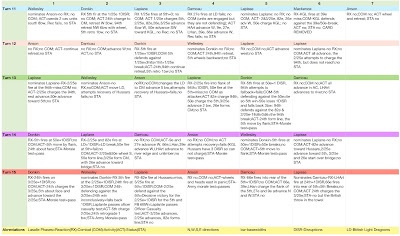 Each cell holds all 4 phases of the game mechanic. Abbreviations are at the bottom. Very good news, seems to be a good playable adaptation to allow lasalle to be played solo. A very good AAR. perhaps a guide could be constructed and submitted to the honour forums for all the solo gamers to try this system. Well I think it could do with some adjustments, I am hoping to see Mike48 version. I have posted a link on the Honour website, but I am quite interested in getting feedback and criticism as this was my first stab at it.